Homemade chai spice cashew milk is simply delicious, more nutritious, and less expensive than buying it at the store. This recipe makes about 4 cups of chai flavored cashew milk. I was inspired in making my own version after seeing BluePrint’s White sold at Whole Foods a la carte for a whopping $10.99 a 16 oz. bottle! It makes a lot of sense because I can buy a pound of raw cashews for HALF that cost. The rest of the ingredients I found in my fridge and cabinet. The homemade version is better for you anyway because the longer it sits on the shelf, the less nutrients it will end up having. Making it fresh made a big difference in the flavor too. Cashews are rich in “heart-friendly” monounsaturated-fatty acids. They are also a rich source of essential minerals such as manganese, potassium, iron, magnesium, zinc and selenium. Just 1/4th cup provides 97% of your daily value of copper! Evidence from 4 large studies published in the British Journal of Nutrition were combined to show that consuming nuts 4 times a week resulted in 37% reduced risk of heart disease compared to those who rarely or never ate nuts. 1. Soak cashews in 1 cup of the water at least 2 hours or overnight. 2. Juice the apple and ginger. 3. 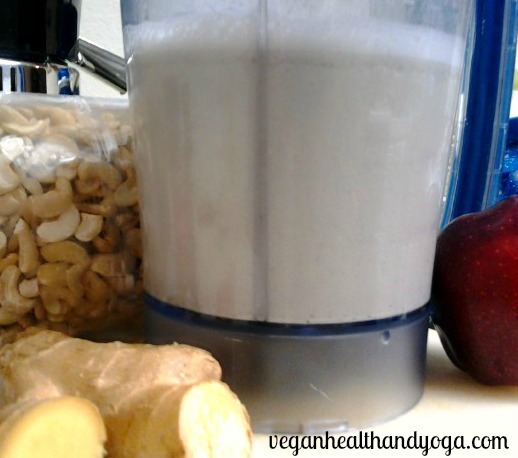 Add cashews and the water into the blender on high with an additional 2 cups filtered water. Use the same water the cashews were soaking in to keep all of the nutrients. 4. Next strain the milk through a filter or cheesecloth. These nuts are naturally soft so they will blend nicely into liquid but after letting the milk sit, the cashew sediments will start to settle down. 5. Once strained, add the remaining ingredients including the apple and ginger juice. Stir well and chill for a few hours. I’ve never had a raw cake before much less make one! But this recipe deserved some credit and not just because of its virgin raw status, but because of the aroma and the flavors! 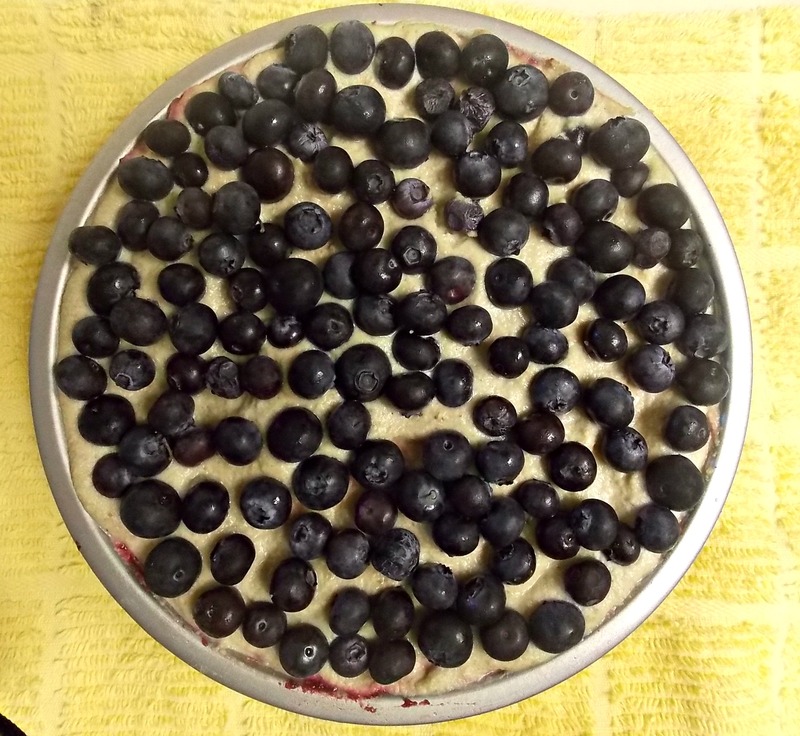 I made this cake around the 4th of July so I used blueberries for a topping to create that red, white, and blue effect. I think next time I will top it off with some bits of chopped pecans to compliment the amazing cashew frosting. Nonetheless, this raw cake was definitely worth sharing. So now, each time you want to reach for dessert, with this recipe you can be rest assured you will be getting that extra serving of vegetables while enjoying cake at the same time! First, juice some beets and carrots. Try using a centrifugal juicer versus a masticating if possible. Masticating juicers extract juice more efficiently leaving you with a drier pulp. If you don’t have a centrifugal juicer, simply add some of the juice back into the pulp. If your not a big beet person, you can just use more carrot pulp with less or no beet pulp. Second, blend carrot beet batter ingredients in a food processor until it transforms to a consistency of thick mud. Aim for gooey, not runny. If ingredients don’t move while blending, add a splash of coconut water and push down the ingredients with a spoon or spatula. Take a taste test and you will be amazed at the flavor just created, YUM. Next, blend frosting ingredients for about 2-3 good minutes until everything is very smooth. The cashews will eventually thicken up and become very creamy after all the ingredients are blended. Don’t worry if at first it appears runny because by the time you come back to spread the cake, it will have thickened up perfectly. You will be amazed at the smell of this mix! Now, in a deep forming cake pan, spread a one inch thick layer of the beetroot mixture into the pan. Then add a layer of the frosting. Repeat the layering process until filled. You can also use a regular cake pan as I did but its best to use deeper cake pan so you can layer it high. You can also leave some for later to frost the sides after it molds in the freezer. Freeze the cake for a minimum of 3 hours. After its molded, remove the cake from the pan onto a pretty plate to decorate it. Finish frosting the cake with the remaining cashew cream. 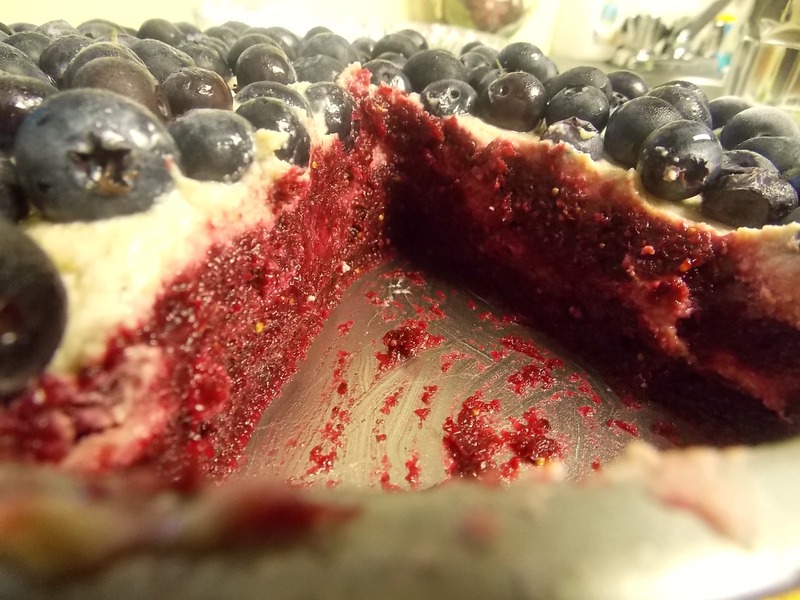 I just topped mine with blueberries but you can sprinkle some left over carrot beet pulp for a touch of color or top it with some chopped pecans to compliment the frosting. An even nicer touch would be to decorate it with some edible flowers for an awesome display at a potluck or party… Enjoy! Cashews are smart food. Their bursting with copper providing a whopping 97% daily value for only 1/4 cup. Copper is a key mineral needed by many systems throughout the body. It is used to build strong tissue, maintain blood volume, and to produce much needed energy! Its a critical nutrient because we don’t have much reserves stored for use within the body. Cashews are also loaded with magnesium, manganese, zinc, and phosphorus, heart healthy and immune building nutrients. They can help fight heart disease, control high blood pressure, and even boost our mood knocking out depression. In fact, just two handfuls of cashews will have the therapeutic effect of a dose of Prozac! If your the type of person that generally avoids eating nuts due to the high fat content, you don’t have to worry. Cashews are actually lower in fat than most other nuts plus the fat nuts contain are actually good for us. A study recently published presented by Dr. Greger above showed groups consuming up to 3 handfuls of nuts gained significantly less weight than expected. One group ate 40-50 nuts a day for 6 months and only gained a quarter of a pound. Still, another group ate 3/4 CUP of pecans DAILY for 8 whole weeks and didn’t gain an ounce! Some nut consumption even resulted in weight loss as with the macadamia. You’ll actually be doing a huge favor to your health because nut eaters tend to live longer and avoid heart problems than people who don’t eat them . Just stick to RAW nuts to avoid unhealthy ingredients.